Talking about everyday fashions, hair, cosmetics, handbags & accessories and issues affecting women. Just like Chloe, but for less. Inspired by a fabulous designer original, this gorgeous Primo Limited Khola bag will always look good no matter how you wear it. With a seven-inch drop handle, you can wear it on your shoulder, your arm or carry it by hand. No matter how you carry it you will feel the supple high quality synthetic leather that is stitched by hand in monotone colors to match any one of the 5 colors this bag comes in. From bright mustard to basic black, the Khola bag from our new designer line has a lot of detail. The inside has a hand-sewn lining with the contrasting synthetic leather color on the zipper pocket, plus two open pockets for cell phones or keys. This bag comes with several outer pull tabs and zipper pockets to store all of your personal items and brass-tone hardware. 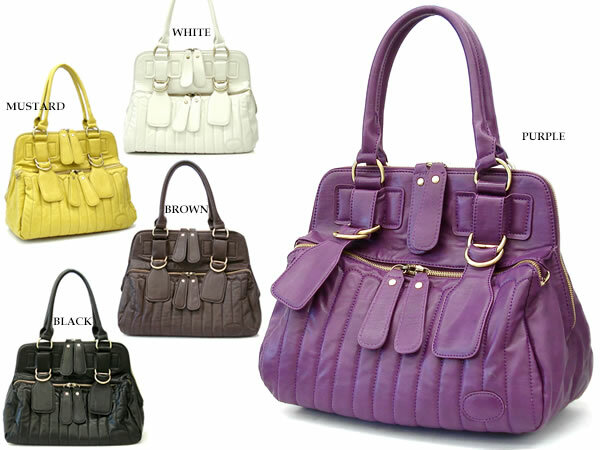 Tips on shopping for a handbag buddy. Hair Removal: Which Method Is Best? What is a Hobo Handbag? What does “embossed” mean on a handbag?